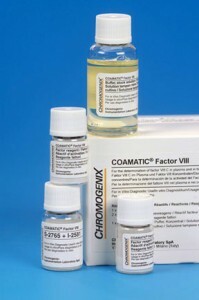 Chromogenix Coamatic® Factor VIII is a chromogenic assay kit for the photometric determination of factor VIII activity in plasma, such as when identifying factor VIII deficiency or monitoring patients on replacement therapy as well as for potency estimation of FVIII concentrates. This Factor VIII test kit fulfills the requirements of the European Pharmacopoeia for factor VIII concentrate testing. Co-lyophilization of reagents for convenient handling. Reliable tool for hemophilia classification. No interference from heparin levels up to 1.5 IU/ml. The Factor VIII kit has two measuring ranges plus validated and documented protocols for a wide range of instruments. In the presence of calcium ions and phospholipids, factor X is activated to factor Xa by factor IXa. This activation is greatly stimulated by factor VIII which acts as a cofactor in this reaction. By using optimal amounts of Ca2+, phospholipid and factor IXa, and an excess of factor X, the rate of activation of factor X is linearly related to the amount of factor VIII. Factor Xa hydrolyses the chromogenic substrate S-2765™ thus liberating the chromophoric group, pNA. The colour is then read photometrically at 405 nm. The generated factor Xa and thus the intensity of colour is proportional to the factor VIII activity in the sample. Hydrolysis of S-2765™ by thrombin formed is prevented by the addition of the synthetic thrombin inhibitor I-2581 together with the substrate. PRECISE. SENSITIVE. ACCURATE. Coamatic® Factor VIII for better hemophilia testing. The Chromogenix Coamatic® Factor VIII assay kit provides reagents and chromogenic methods for determining factor VIII activity in human plasma and in factor VIII concentrates. Factor VIII is a high molecular weight plasma protein which serves as a cofactor to factor IXa in its activation of factor X to Xa. Deficiency of factor VIII causes a severe bleeding disorder, hemophilia A. The severity of this bleeding disorder is inversely related to the factor VIII concentration. Hemophilia A patients are generally classified according to their factor VIII activity into three categories: <0.01 IU/mL = severe, 0.01-0.04 IU/mL =moderate and 0.05-0.25 IU/mL = mild hemophilia.